"Christian theology has been shaped by and has to negotiate with empire throughout the centuries. I am interested in developing Christian theological reflection and practice in the postcolonial world. With the rapid development of China and other emerging markets, I am committed to the formation of leaders of faith communities with broad global vision and critical awareness of God’s mission in the world." Dr. Kwok Pui Lan, William F. Cole Professor of Christian Theology and Spirituality, is an internationally known scholar and President of the American Academy of Religion in 2011. She received her doctorate from Harvard University and honorary doctorates from Kampen Theological University in the Netherlands and Uppsala University in Sweden. The author or editor of twenty books in English and Chinese, Kwok’s publications include Postcolonial Imagination and Feminist Theology (Westminster John Knox); Introducing Asian Feminist Theology (Pilgrim); Discovering the Bible in the Non-Biblical World (Orbis Books); and Chinese Women and Christianity, 1860–1927 (Scholars Press). She is an editor of the major reference work Women and Christianity (4 vols., Routledge), and most recently, co-editor of Postcolonial Practice of Ministry: Leadership, Liturgy, and Interfaith Engagement(Lexington Books, 2016). Kwok was the recipient of the Award for Excellence in Teaching in 2009 from the American Academy of Religion. In May 2015, she was awarded the Gutenberg Research Award by the Gutenberg Research College of the Johannes Gutenberg University of Mainz, Germany. 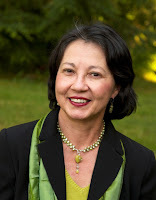 A cofounder of the network Pacific, Asian, North American Asian Women in Theology and Ministry, Kwok has held leadership roles in the Association of Theological Schools (ATS) and the Wabash Center for Teaching and Learning. She has spoken at the Episcopal Church’s House of Bishops conference and at ATS workshops, as well as delivered lectures across the United States, Asia, and Europe. Kwok is advisor to the Religion in the Modern World Series of Rowman and Littlefield and associate editor of the journal Teaching Theology and Religion. Asian and Pacific Islander (API) women have to overcome many obstacles in order to become leaders in their professions. First of all, they have to challenge persistent cultural stereotypes that portray Asian women as gentle, meek, and submissive. The image of a soft-spoken and compliant Asian woman does not fit the cultural expectation that leaders should be active, aggressive, and willing to take risks. API women often have to work much harder to prove ourselves and overcome negative stereotypes. But in many Asian communities, women who work outside the home are still expected to be responsible for their children’s care. While it may be possible for Sheryl Sandberg to “lean in” because she can afford to have a lot of help, many women simply do not have that option. In Women Don’t Ask, Linda Babcock and Sara Laschever explore the personal and societal reasons women seldom ask for what they need and deserve at home and at work. This is especially true for Asian women who are new immigrants. They are grateful when they are offered jobs and don’t ask for higher salaries or negotiate benefits, and they frequently do not even realize they can ask. They may also be passed over for promotion. API women may also be hindered by the cultural script that says you should not blow your own horn, and if you ask, then you are too demanding or pushing too hard. API women find it hard to take up leadership positions because there are few models and they often harbor doubt about their abilities. Studies have shown that men apply for jobs when they meet 60 percent of the qualifications, while women apply only if they meet 100 percent of them. In theological education in the US and Canada, women make up only about 30 percent of the faculty. Racial and Ethnic minority professors made up only 21 percent of the faculty, showing that seminaries and theological schools do not match the diversity of the population. Asian and Asian American faculty make up about 6 percent, and among them only a small number of women are in full professor rank. Since API women have seldom seen one of their own as a president or dean of seminaries or as a top leader in other professions, it is understandable that they are hesitant to break the glass ceiling. Very often, they are nudged by mentors and trusted friends to apply for and take up leadership posts. Lesbian and queer API women find the path to leadership tortuous for they are marginalized by both white culture and their own ethnic communities. Many people have hoped that when women become ordained, the church will change. But unfortunately this is not always the case. If the church’s structure, cultural ethos, and liturgy do not change, women are just performing the same roles as their male colleagues, while the patriarchal structure remains the same. Clericalism remains strong, even though we pay lip service to Reformation’s vision of priesthood of all believers. We have often heard about the idea of servant leadership, but very few leaders actually embody this. People sometimes argue that we need women leaders because they will bring a different leadership style, which is more collaborative than men’s. But when some women become leaders, they act as authoritatively as men do, if not even more so, in order to show they are strong and in control. API female leaders can be in a double-bind. If they are not bossy enough, they risk being seen as weak. But if they act aggressively and give out orders, people label them dragon ladies and hard to please. It is important to remember that successful leadership depends not only on the quality of the leader, but also on the people she works with. Women can exercise collaborative leadership if the environment allows and encourages it. I think of collaborative leadership not so much as the style of the leader, but a set of practices the leader puts in place with the help of the community, such as transparency in decision-making, open communication, clarification of roles and expectations, mutual accountability, and encouragement of new ideas and feedback. Collaborative leadership is a process, which takes time and effort, and trial and error. A collaborative leader enables each member of the community to feel they have ownership and a stake in the success of the whole. I was fascinated by how Tony Hsieh has created a cultural ethos at Zappos to keep his employees motivated and engaged. The employees can decorate their desks and working areas to “create their home away from home” with pictures, office toys, and colorful décor. The company empowers employees with tools to succeed, provides opportunities for continued learning, and allows employees to fulfill their higher purpose. * Indra Nooyi writing thank you notes to parents of each of her direct reports so that they could experience pride in their children also impressed me. Integrating employees’ family members is an example of wholehearted leadership and the emphasis on family is a key element of Asian culture. Collaborative leadership works when everything is fine, but is put to the test when conflicts among different constituencies arise. Consider the situation when the board, administration, and faculty cannot agree on the future directions of a school, or when there is a financial shortfall and the church budget has a large deficit. The leader needs to balance the needs and demands of different sectors of the community and is often caught in the middle or in the worse case, ends up as the scapegoat. API cultures can be sources of strengths or liabilities in handling conflicts. On the one hand, API cultures value harmony in relationships and tend to avoid conflicts. But avoiding conflicts may lead to covering up of problems, which will only get worse over time. On the other hand, API women have been caught in the middle and serve as the go between in patriarchal systems. In traditional families, they negotiate between the demands of husbands and mothers-in-law and other in-laws. There may be lessons gleaned from navigating complicated relationships. Female leaders attract admiration and envy from both men and women. As leaders, they are judged more harshly than their male counterparts; just ask Hillary Clinton or Carla Fiorina. This is one of the reasons API women may not want to consider leadership positions because they can’t bear to lose face and be publicly criticized. They have to develop very tough skin to deal with insidious sexism in the workplace. Because Asian cultures place so much emphasis on shame, API women often internalize blame and guilt when something goes wrong. It is important to separate between personal attack and rational criticism. Women leaders need to accept criticisms when they are due, but reject misogynous smears. Many years ago my school invited Rita Nakashima Brock to speak to the community. In her talk, she warned that women need to avoid self-sabotage. For example, a woman might be under so much pressure, with one bad thing piling up on top of another, that she is just ready to snap. With no more than a slight provocation, all of the garbage built up inside would come bursting out. She advised that women need to have a metaphorical “delete” button or a “recycle bin” so that they have a place to put all that negative stuff. Finding a healthy way to decompress and to deal with pressure in life is vital for women leaders for the long haul. In the past, women have tended to share with their confidants to seek support. The recent impeachment of President Park Geun-hye sounds caution. Park said she leads a “lonely life” and trusted too much in her friend. Sometimes women leaders can live in a bubble in their own alternate universe, alienated from the people they serve. It is crucial to lead a balanced life and to have friends and colleagues who can offer a healthy reality check. Meditation, exercise, and yoga are good ways for renewal and relaxation. Women leaders stand on the shoulders of women who have gone before them. In many women’s liturgies, we recall the names of foremothers who have been influential in our lives. We know that our success is based on the work and sacrifice of many other women. Therefore, once we become leaders, let us remember to push the doors wider for women from the upcoming generation. People sometimes ask why I spent so much time in mentoring students and junior faculty. I would tell them that I grew up in a working-class family and my parents came to Hong Kong as refugees. I would never have been where I am today if not for so many people’s encouragement and investment in me. When I first came to the US some thirty years ago, Katie Geneva Cannon and other white women mentored me. Beverly Harrison invited me to speak for the first time at the American Academy of Religion on women’s work in China. When I became one of the few Asian women theological faculty, I decided to help to make the road wider for others. 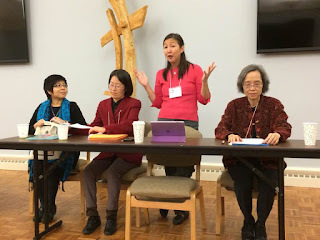 Pacific Asian North American Asian Women in Theology and Ministry was started by a group of Asian and Asian American women, with mentoring by Letty Russell and Shannon Clarkson. In 1997, the Asian and Asian American faculty in the network acknowledged our debt to Letty and Shannon for their many years of service and took over fundraising and other administrative duties from them. The same year we began the doctoral seminar to provide assistance for doctoral students to develop their dissertation proposals and to learn professional skills. Celebrating our thirtieth anniversary in 2015, Su Yon Pak and Jung Ha Kim have coedited Leading Wisdom: Asian and Asian North American Women Leaders, which will come out this fall. As the coeditors wrote, “this book is yet another testimony of how the PANAAWTM movement enables women leaders to experience the nurturing and empowerment necessary to define their calling and ministry on their own terms.” I hope the book will inspire more API women to become leaders to change the church and the world. * Mig Pascual, “Zappos: 5 Out-of-the-Box Ideas to Keep Employees Engaged,” US News, October 30, 2012, http://money.usnews.com/money/blogs/outside-voices-careers/2012/10/30/zappos-5-out-of-the-box-ideas-for-keeping-employees-engaged. This is a presentation made at the annual meeting of PANAAWTM on March 19, 2017 at Delaware, Ohio.